The reference .wav files in place was check so I have now unchecked that and will try again. As far as the program reinstall, I did do that but just from a thumb drive copy due to the computer upgrade. I went to the App Store and it was trying to recharge me for the program so it did not get downloaded from there. The program that I reinstalled from the thumb drive is behaving the same. Many thanks, when processing FS2 E10 Momentum.fcpxml we get a lot of "Unable to reference media, embedding in AAF" which indicates that when you run X2pro that you have "reference wav files in place enabled", in which case some media may not be put into the AAF. Can you confirm. We are still looking into why the .txt file is not being created, were you able to uninstall and re-install the x2pro application ? Last Edit: 8 months 4 days ago by James Carrick. Here is the copy of the console from today after I tried to create a complete AAF. The files are all imported audio- music tracks and Zoom Audio files from an external mic and recorder. Console is in applications, utilities, it is an Apple utility that shows what the Mac is actually doing. One thought here is that you might want to uninstall X2Pro and re-install it as things are behaving oddly after the os upgrade in that we can write the AAF but cannot write the .txt file with it. Where in the program do I access the console? You should be able to copy the text from the pop up window into a .txt file, as it will detail the name of the file that it is struggling with. Would you be able to open up console, then process the XML in X2Pro and then copy the console text into a .txt file and forward to us ? The console should tell us why the sidecar .txt file is not being created. We qualified High Sierra some time ago, so that is not the issue. The FCPX version we would suggest you use would be 1.8 (we can work with both versions). Metadata options, we don't take any notice of, this just determines how certain metadata (if present) is presented in the resultant XML. I have been creating the AAF to the desktop without success of creating a .txt file with it. I've tried several times. I'm concerned that this started happening once I switched over to the new computer with High Sierra. Could there be a compatibility problem with the new OS? Also, when given the option to create the XML in Final Cut, it's asking me to use version 1.7 or 1.8 and also select from a list of metadata options. Could there be a different selection that I can choose there that would help? Again, the files that are being created are missing off camera audio, anything recorded on an external mic with an audio recorder and now music .wav files. 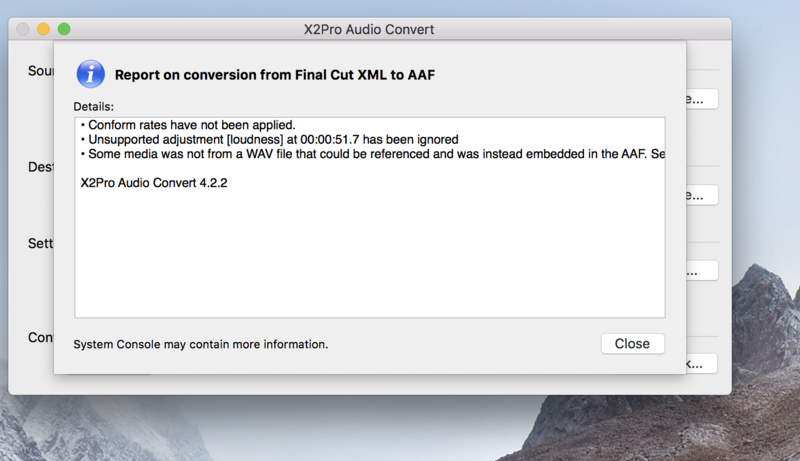 In which case to investigate the audio issue, do you get a pop up window when processing the FCPXML called "AAF created but with issues" if so can you copy the entire contents of the pop up window and forward to us please. To investigate the failure to create the .txt files, as a test would you be able to create the AAF locally to your desktop and if so does it create a .txt file with the AAF ? I've tried that and before I switched to High Sierra with the new version of FCP it was creating a txt file. Now it is not. There is no txt file associated with any new AAF I try to create! It should be a .txt file named the same as the AAF and created in the same location you are creating the AAF's in. In the past the .txt file has been created. I am not seeing them now. I even looked elsewhere in my computer and they are not anywhere. I tried again and no .txt file and even restarted the program and tried again and no .txt file. There should be a .txt file created in the same location as the AAF, can you please forward this. Here is the original message that popped up (attached screen shot). The files missing are all my Zoom Mic audio and music. Can you run X2Pro again and send us the message you get once it completes?